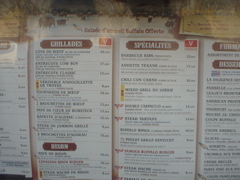 The menu at Buffalo Bill's Restaurant at Place de Republique. "Grillades" means "grilled". 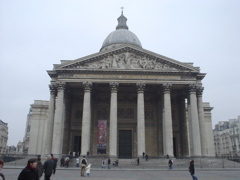 Note the "entrecote cow boy" and the "barbecue ribs"
Polly asked me about BBQ in France. Now you know. 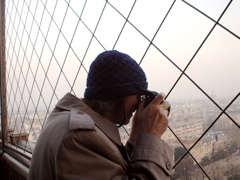 My dad atop the Eifel Tower, taking some pictures. 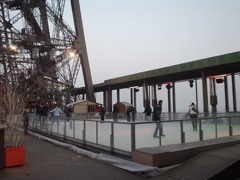 On the Eifel Tower, there were still Noël decorations everywhere and there was a small ice rink!! 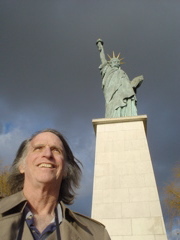 I did not go ice skating on the Eifel Tower. 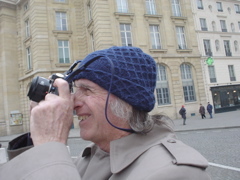 It was cold and windy and getting dark. 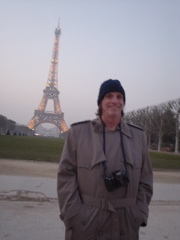 My dad in front of the Eifel tower at sunset while the tower was doing it's hourly light show. 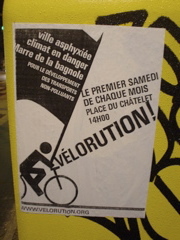 «Vélorution!» Bicycle revolution. 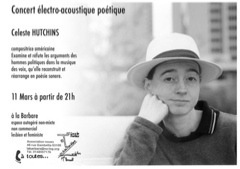 The first saturday of every month at Place Du Châtelet at 2:00 pm. 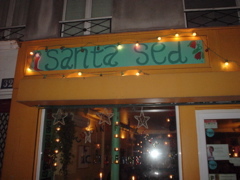 Santa sed, a Chilienne restaurant in the 10th arrondissement. 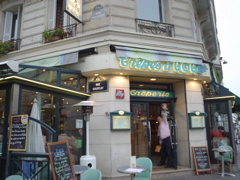 Friendly wait-staff (bilingual french and spanish) and good food at good prices. They had actual, wonderful, real salsa!! There's a restaurant in Berkeley with the same name. 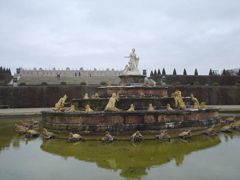 When I stopped to take a picture of this place, the host came out and waved. He encouraged us to compare the two restaurants with the same name. However, none of us ordered a crêpe. Nicole got a gallette, but it's not the same. So this place in France wins on variety. Berkeley wins on prices. 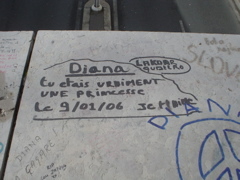 The spot over where Princess Di died is covered with graffiti in her honor. 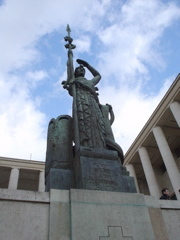 A statue at Palais de Tokyo for the French war dead. 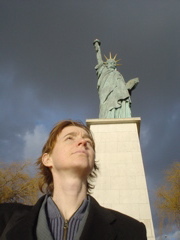 So I went to NYC . . . just kidding. 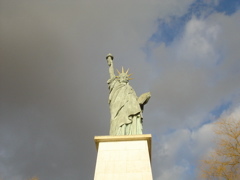 The statue of Liberty was, of course,a gift from France. 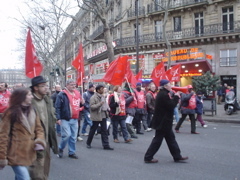 They have a short one in the 16th arrondissement. 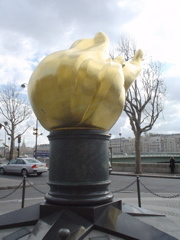 Je suis fier d'habiter à Paris, parce que au moins je sais que je suis libre! 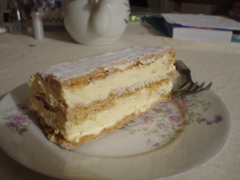 This is some sort of pastry that came home from the bakery. The top is dusted with sugar. The three crusts are like croissant, but harder: flaky, buttery pastry. The middle is cream whipped with sugar until it pretty much turned to butter. A heart attack on a plate. 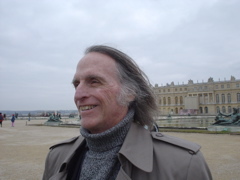 I'm going to miss Paris when I have to leave. 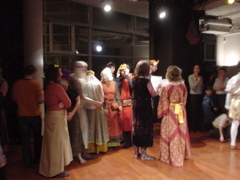 I went renaissance dancing. Some people wore costumes, but I did not. I went because of the live music. 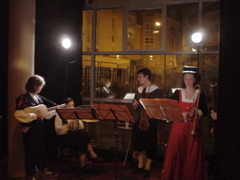 The sitting musician is Solène. 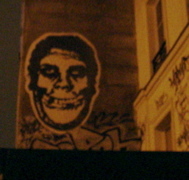 Zombie Andre the Giant has a posse. It's a huge can of beans and duck. 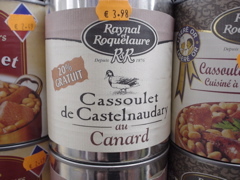 In Paris, if you're hungry, you can go to a little neighborhood connivence store and get some canned duck.